Somehow the luck of the Irish has missed Conan O’Brien and bounced on to Jimmy Kimmel, who seems to been given the cloak of media invisibility this week, even though his slot at ABC is prime territory for ABC and Disney to scuttle NBC’s fortress-hold on late-night television. Rather than skewer the larger-than-life Leno, it should have got sharp guys like Disney’s CEO Bob Iger, a career ABC man, thinking. Late night programming has helped NBC on more than a few occasions over the decades to rebuild its line-up. A good TV show at the 10-11 hour can turn into a hit show if folks also expect to watch a little news and tune into at least the opening monologue for Conan or Jay. The late night comic/hosts keep the network in the news, and provide, other than the Daily Show, the satirical line on politics and major events of the day to chat up around the office. Kimmel’s offering at ABC is, like television itself, a medium. It doesn’t get much better. It doesn’t get much worse, but it will never be the stuff of toppling O’Brien, Leno or Letterman. Conan is much more the Everyman that Carson was. He has an affability and a broadening of his television persona with time and age that, with Leno out of his pathway, can make him easily one of the historic faces of network television. The Synergies for Disney also work well. They like to tie their big names into their amusement park operations and leverage their prestige people to raise ad revenues for ABC. 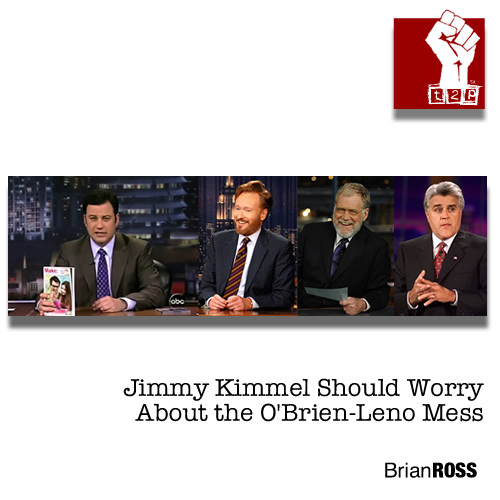 There is no doubt that either pushing Kimmel back to midnight or getting rid of him altogether and replacing him with either O’Brien or Leno would be a huge win. Moreover, if one of the two NBC hosts gets cut loose, or is given ability to shop, ABC will want to get them, rather than lose them to competitor Fox or, worse still, into the cable universe which is already eroding network television’s audience shares along with the Internet. Does anyone really think that ABC can keep Kimmel in a landscape with Letterman on CBS, Leno most likely on NBC, and O’Brien over at Fox? Letterman is a pretty shrewd guy, but he missed the mark when he said that Conan staying at NBC and holding on was good for the money. Whomever gets cut loose by NBC will have an epic bidding war between the other two to land one of the top late-night hosts for their network. What is also at stake here, now, is the real value of the Tonight Show. Mr. Zucker has managed not only to pass up former NBC boss Fred Silverman in the stupidity department, flushing his 10pm primetime spots to the cable nets, but he has now devalued the crown jewel of the NBC network: The Tonight Show format. At this point, the mantle of best can go to any of the networks, and the power on the TV schedule that it brings may shift. So Jimmy Kimmel should be worried. The last laugh will probably be on him. This entry was posted on January 14, 2010 by Brian Ross in 2010, ABC, CBS, Entertainment, Fox, NBC and tagged Abc, Cbs, Conan O'Brien, Fox, Jay Leno, Jimmy Kimmel, Jimmy Kimmel Live, Leno Conan, Media, Media News, Nbc, The Jay Leno Show, The Tonight Show.